More Everything has teemed up with Black and White Tees to offer you the opportunity to win some great zombie merchandise! 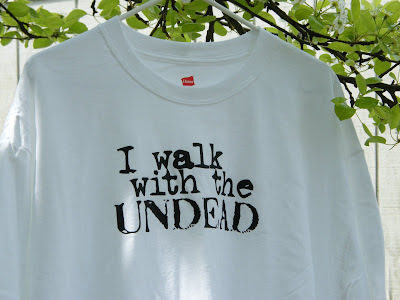 First, is a white shirt with the print "I Walk With The Undead" in black. The shirt is a size Large. To enter, email your name and address to blackandwhite@zombiesandtoys.com. 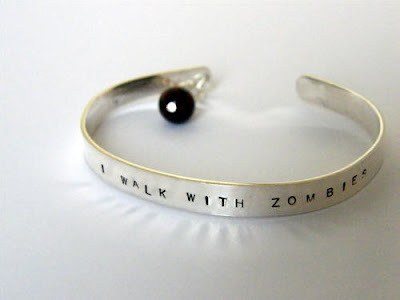 Next, we have a silver bracelet with "I Walk With Zombies" engraved on it. Enter by emailing your name and address to moreeverything@zombiesandtoys.com. You can enter both contests and it is possible to win both. Just make sure to have your entry submitted by July 20th. omg.. i love the bracelet..
fingers x crossed.. turning blue.. going numb.. falling off..
That bracelet is wonderful! I'm a zombie and so need that!